• Social Communication Program for students 5 through High School who have social communication deficits. • Language to Literacy Program for students 6 to 21 years of age who have language and literacy deficits. • Leap Into Literacy Program for students 5 through High School who are not reading at grade level to maximize their language and literacy skills. • Intensive Vestibular Based Program. • Intensive Fine Motor/ Handwriting Program. • Using his full range of facial muscles, Milo can model most emotions utilizing exaggerated expressions. • Like the students he works with, Milo can walk, turn his head and move his arms. • Robots bring a unique skill set to autism therapy. • Designed to enhance and reinforce interactions and skills taught by facilitators to support the success and outcomes geared towards generalization. robots, and are excited to learn from and engage with them. • Robots can deliver lessons with repetition as needed, without frustration. • Robots verbally deliver interactive lessons with a simplified language simultaneously with visual support icons to aid auditory processing and comprehension. • Robots can collect and provide data to facilitators and parents to support ongoing evaluation and success of the students’ learning paths. 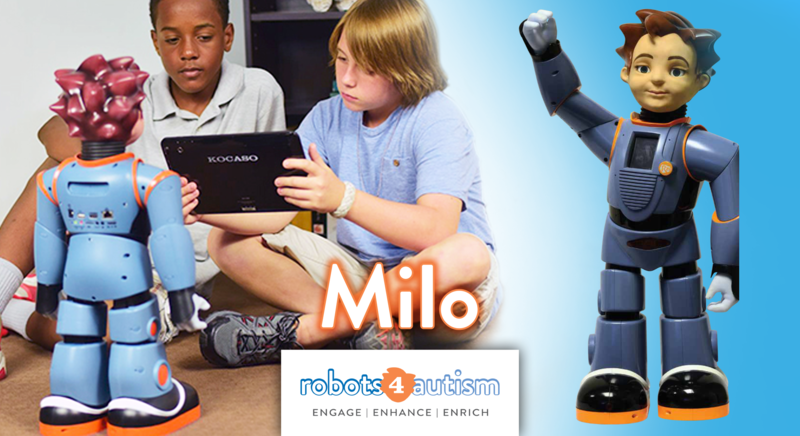 Top autism experts from the Autism Treatment Center of Dallas and the Callier Center for Communication Disorders at University of Texas–Dallas worked with RoboKind to develop the Robots4Autism research-based, multi-phase autism curriculum. Written as social narratives, the curriculum is delivered verbally by Milo who is connected to a tablet where he can display multiple choice questions and show supporting text, images and video to enhance the lesson. • Emotional—Including identifying facial expressions, learning how to respond to others, and labeling feelings. • Conversational —Including how to begin, maintain and end a conversation with adults and peers. • Situational — Prepare students to understand and succeed in situations that are less familiar (play interaction, birthday parties, more). • Calm Down —Including techniques to reduce physical responses to stress.